Didn't the page protector pocket (gad, that's a mouthful!) come out cute? And here is the calendar printable from the fabulous Ray Blake, who pioneered calendar printables in the Faux Dori world. You can snag a copy here: www.mylifeallinoneplace.com. Then of course, our printable of the Stick It Down challenge is included too. You can find the list HERE. They are so much fun to make! I still have a couple more to do and another one to send out. Thank you so much for all of you posting yours on Twitter. They came out so great! Hi, Darcie here again. We are celebrating Valentines Day tomorrow on our Ustream show, which some people noted was ironic since we are "down with love" lol. 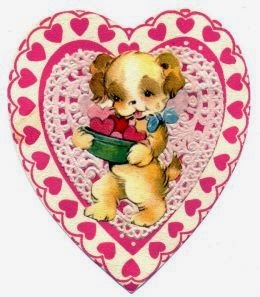 So maybe Valentines Day is for lovahs but we love our families, our pets, our friends and the occasional homeless person (don't ask). AND we love flowers and chocolate - what's not to love? We have much to be thankful for, that's for sure! So, as usual, there is a story with this one. About 9 years ago, Johnna was indoctrinating me in the ways of the cult known as Scrapbooking. It had secret implements (well, not secret to anyone with the Internet) and rituals that involved arranging items in a prescribed way on an unusual size sheet of paper. So, I tried, I really tried. After completely over-thinking the process, whining and moving the same flower around numerous times with very little success, she looked at me and said, "Just stick it down. You're driving me crazy!" So it became an inside joke for all these years. Hence, the birth of the Stick It Down Challenge. We have posted a list, call it a scavenger hunt if you will, of things you can locate in your area and in your life to use as collage materials. The list is posted on the next post. If you agree to the challenge, you will attach the items in a journal and post pictures. We will draw a winner from the group who completes the challenge. Use the hashtag #stickitdown and post pics on social media More information given on the Ustream show. 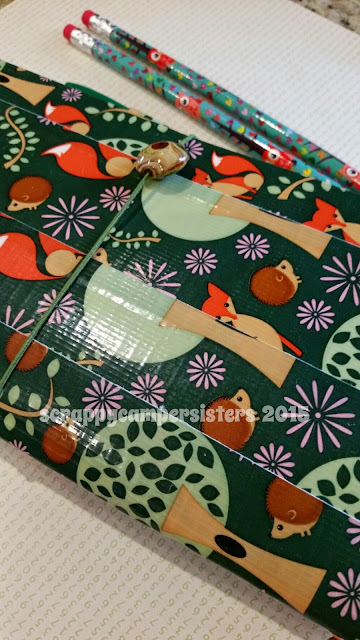 The book we are making is a duct tape version of one of my favorite journals, the Midori Traveler's Notebook. Mine has a beautiful leather cover and patented binding system of elastic bands that allows you to customize what you place in the book. 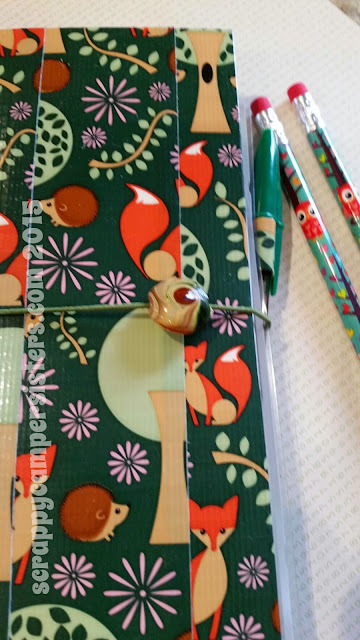 I use mine when I travel and otherwise hoard it, so I thought I would make something inexpensive and easy to throw in my purse and keep with me for writing and collage. I have made a few of them over the past couple of years and while I am sure other people have too, I think mine is a bit unique. 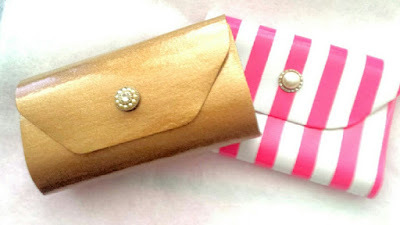 I showed Johnna how to make them and she loves hers, so I hope you will too! We will be using the beautiful paper from Echo Park called "Lucky in Love" for a Valentine's Day themed journal. See you then! Hi, all. This is Darcie. I am preparing for our show tomorrow and thought I'd post some pics from the January episode where Johnna, Mom and I altered rotary telephones and made them into baby wipe holders for our mixed media projects. If you saw the show, you know that when you lift the dial, the baby wipes come through the opening. This is the one we made on the show. I was so determined to use a princess phone because they are so adorbs, but it was challenging. I ended up cutting the baby wipe bag in half to fit and it is so cute! It now sits on my desk and is very handy when I need to grab a baby wipe. You could also use this for tissues. There is a pencil that goes into the handset and on the other end, if you unscrew the earpiece, there is a cup for paper clips and brads. As promised, HERE and HERE are the pdfs of the address book that you can print out and make for yourself. It is in two parts so that the pages can be printed double-sided to make up the inside of the book. I used a 5/8" circle punch to make the tabs, so they are not on the template. You can choose to do that or not. Next up is what you will need for tomorrow's show! Thrift Store Thursday And A Preview Of Saturday's Ustream Show "Stuck On You"
Yesterday, I did my rounds at my favorite junk and thriftstores. I love just digging through piles looking for hidden treasures. I was actually just wanting to get a couple of record albums for a few missions trips I have coming up this year and I actually did! One is for the Caribbean, when I go Dominica in the spring and the other is Scandinavia. 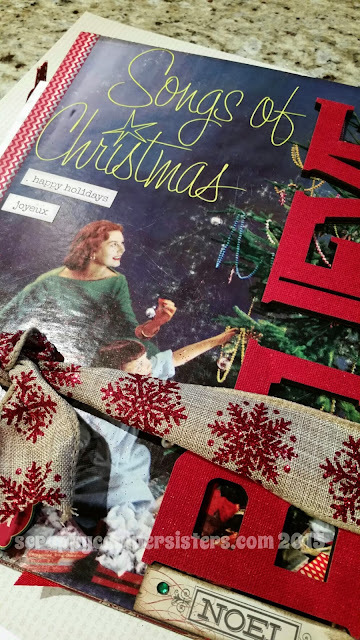 Here is a photo of my Christmas journal using the front of an old record. I showed it on our December ustream show. I am not telling you to go raid your husband's record collection or to cut up heirlooms, use the ones where the album is all wrecked and scratched beyond repair. So please as our friend Dede "inkwell" would say "Don't email me!" The canister box and the wood expandable rack I am going to paint with chalk paint and use in Zippee. The canister has a plastic canister inside I can take out and wash. However the lid is not lockable but I don"t think racoons will raid coffee, hmm not sure on that one. The rack I think will be handy in the potty closet to hang my shower caddy, beach towel, bathing suit, etc. Last year, I took a class with Christy Tomlinson, she made bracelets out of belts, differently than how Darcie showed you how to do on one of our Ustream shows. So I had to snag these 2 belts for a buck a piece. 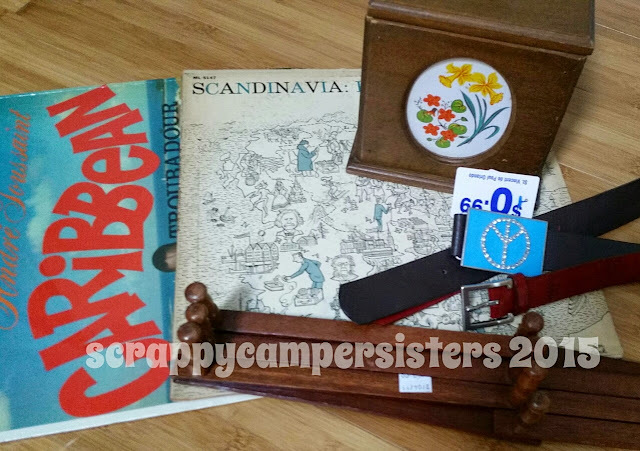 The peace belt buckle will be perfect as a closure on my Scandanavian Journal. One of the junk shops I went to had books half off, uh I love books and I had to limit myself which was really difficult when they are only 25 and 50 cents! Greek Isles is on my bucket list so there is no reason why I shouldn't start working on that travel junk journal! A dictionary, you can never have enough dictionary paper in my opinion, and this one has cute illustrations. The blue linen book I am going to gut and just use the cover, the inside had water damage so I won't feel bad gutting it. I found a great England book, I know I will be going back there in the near future for sure so I might as well start reading about it, plus it is a nice addition to my Downton Abby addiction! 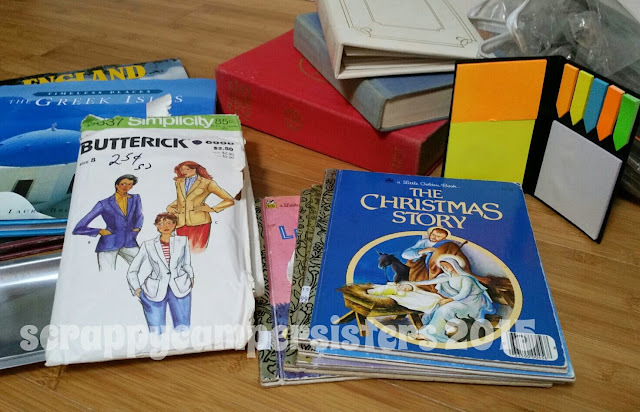 Last year, Darcie, JJ and I attended a Debbie Schuh class where we made darling mini albums using Golden books, I picked these up for 25 cents each. They will make darling presents. Speaking of presents, I found an entire bag of these small little booklets, when I opened the booklet up they were post it notes! I bought the whole lot of them. How cute are these going to be with some gelli plate sticky back canvas? So excited will probably get to work on those ASAP. That white leather photo album I am going to add a Tim Holtz ring binder to the inside and put some watercolor paper in it, the photo pockets for Peerless water color palette papers and I am good to go, will post photos soon of that upcyle. By the time I get this post up I will have it finished! Old patterns make great gift wrap and at 25 cents need I say more?!! So, now on to Saturday's class "Stuck On You". Darcie will be teaching you how to make this adorable "Ductdori" and we have a month long challenge for you to go along with it. Click there if you want to join me in song. Look for the tomorrow's post where you will find the free download for the Stick It Down Challenge and make sure you use the hashtag, #stickitdown on any social media site and post pictures of you participating or your ductdori and a finished challenge list. We will be having a drawing from the participants on March 31st. I will hopefully get to chat with you on Saturday,February 14th, yes it is Valentine's Day, here is the link to our Ustream Channel and we will be on at 10 am EST. Anyone who follows me on Twitter knows that I am a huge fan of the Original Documented Life Project. Here is a link, highly recommend you check it out! Last year I had the pleasure of taking a class with the lovely and talented Lorraine Bell, here is a link if you want to read about it, one of the artists from the group. We created a cover for the Dyan Reavely Art Journal and I never got around to using it. When they announced they were offering the class again and using the larger of the 2 journals I opted to use the smaller one since I want to be able to take it with me in my purse. 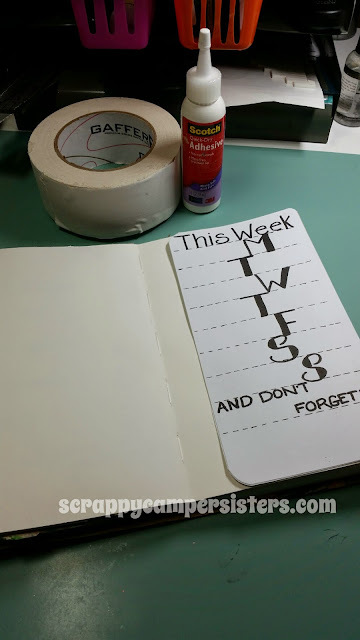 I kept the week tip in idea from last year, I love the thought of keeping it all in one book, journal, planner and arting on pages. I made this little week tip in to add to my planner for the month of February. I printed it out on watercolor paper so I can add some splashes of color depending on what the DLP challenge is for the week. I kept it simple so I can doodle or stamp or whatever. 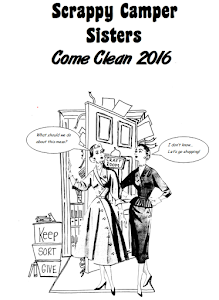 If you like it too, here is a PDF you can download for free. It is sized for the bigger journal but you can resize for any journal you may have. Today I wanted to get caught up on all the projects looming over my head. 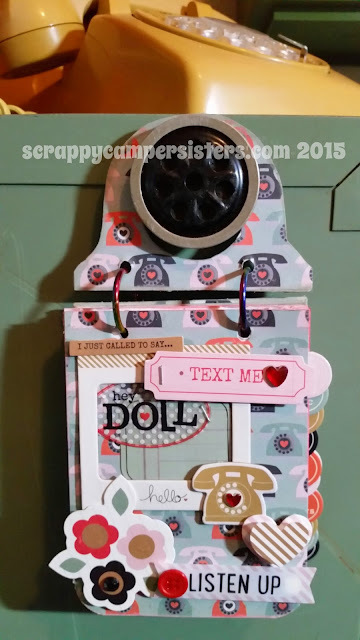 The altered phone mini album from our January stream was one of those projects. So today I got out this fun Pink Paislee paper and then I added magnets to the back of the speaker from the handset of the phone and I hung it on the side of my filing cabinet. Look how cute it is! Trying to stay on top of things and have fun while doing it, that's my goal for this year! Happy New Year Fellow Campers!! Happy New Year!! This is going to be such an exciting year with many new adventures ahead. We are heading out to Anaheim again for CHA and YES we will be streaming live, I have newer equipment so hopefully the quality will be better, fingers crossed. 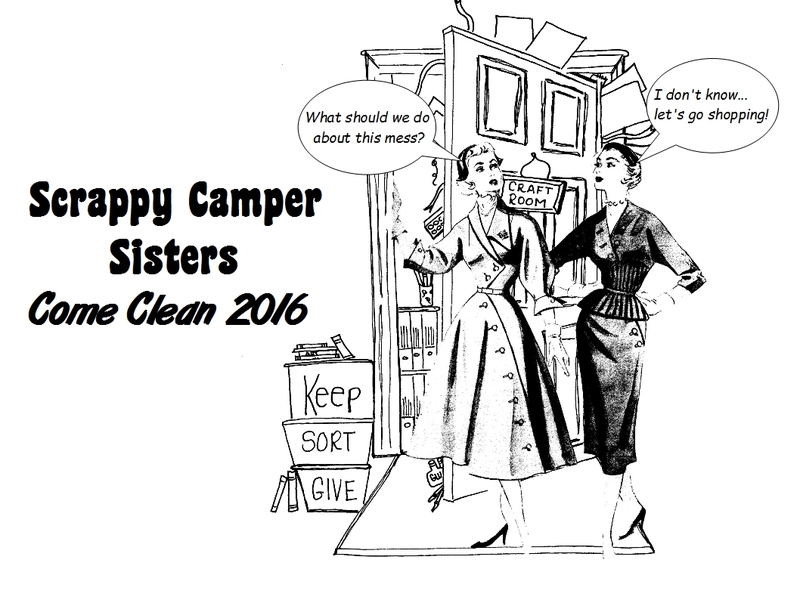 Please follow us on Ustream and click "get notifications" here www.ustream.tv/channel/scrappycampersisters you will not want to miss a minute of the excitement. 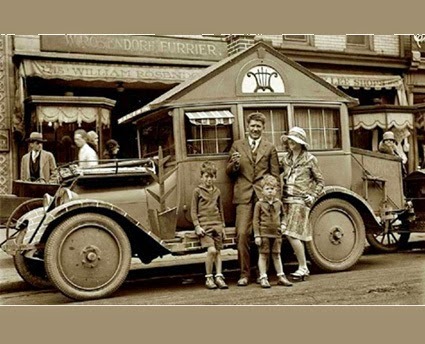 Don't you just love that you can have a portable house when you own a camper! I love that idea! It's like a getting to decorate a Barbie house but in real life size. Darcie bought me the cutest trailer salt and pepper shakers for Zippee for Christmas and I have been working on some custom pillows for the bed/couch to make Zippee even cozier. Next camping trip is Anastasia Island for me. It is a beautiful oceanside state park. Can't wait I got new flamingo party lights and I scored pink string lights 70 percent off at Hobby Lobby to hang from tree to tree at my camp site. Pretty soon I am going to need a trailer to tow behind my trailer with all the stuff I need to set up my glampsite! Tomorrow we are headed off to Mt Dora for a day of exploring and might have to hit a few antique shops along the way.